Kate Kerr is a crafts development consultant, and an instructor in the Division of Arts and Humanities, Shawnee State University. She is based in Wheelersburg, Ohio, United States. There are multiple reasons for ensuring the maintenance of cultural traditions: historical, cultural, economic, ecological, and so on. 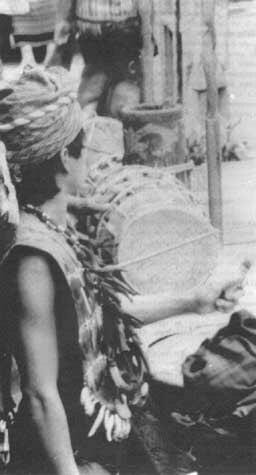 This article, based largely on the author's experience in Indonesia, focuses on the economic potential represented by traditional crafts in terms of employment opportunities, small business enterprise, trade and tourism; and the potential of crafts development to enable local people to improve their well-being without depleting renewable natural resources. People living in forest areas face complex adjustments as their traditional way of life is confronted by "development". The concerns of forestry - sustainable development and management of resources; conservation and environmental protection; development of forest-based industries; etc. - all have a direct impact on people. Land use and tenure rights; farming practices; employment opportunities; access to basic human services; participation in policy development - all are mutual-interest issues. Crafts development can represent a constructive, positive contribution to the development of alternatives to resource-destructive agricultural practices, based on the provision of gainful employment. Although research is limited, available evidence provides clear indications of the actual and potential economic clout represented by handicrafts within the economies of developing nations. By far the most comprehensive research to date on Asian artisans has been commissioned by the International Development Research Centre in Ottawa. At the request of seven governments in the region (India, Indonesia, Malaysia, Nepal, the Philippines, Sri Lanka and Thailand), teams of researchers comprising economists, anthropologists and marketing specialists carried out an in-depth study spanning three years, 1983-86. Among the crafts studied were those based on wood; rattan and other non-wood forest products; textiles; metal; pottery; and stone. The study considered the artisans themselves as well as design and production issues, including raw materials supply; marketing; and policy. The Canadian study evinced the contribution of the handicraft sector to overall employment opportunities in Asia. For example, in India, more than 2.18 million people are engaged in full-time craft employment (Pye, 1988). The contribution to foreign-exchange earnings was also significant; revenue from exports of artisan-produced handicrafts represent 16 percent of India's total trade and 13 percent of Nepal's (Pye, 1988). Forest-based crafts were identified as having particularly high potential, in comparison with other crafts. In the region of Central Java, where woodcarving represents roughly 75 percent of the handicraft exports, studies by the local government show that the average woodcrafter's annual earnings for the period between 1979 and 1984 were slightly higher (Rp 846000) than those of other handicraft artisans (Rp 830000). A field report for Aid to Artisans (see box) covering the same area during the period 1987-90 found average annual earnings for potters to be Rp 300000 (Gearheart and Kerr, 1987). Handicrafts can be divided into two basic categories: tools and household products for example, baskets, pottery, textiles, furniture - and ritual objects. In most cases, the raw materials for handicrafts production are obtained from forested areas. In the traditional village setting, there was always enough time to embellish tools and utilitarian objects. Carving the handle of a sword increased its value and power. 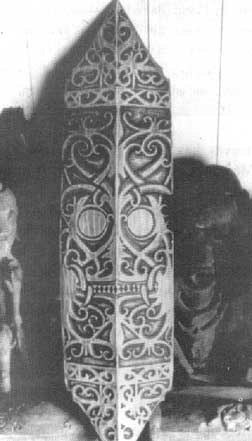 The Dayak women of Borneo make woven baby-carriers adorned with prized beads, amulets of boar's teeth, bear claws and old Chinese coins. The family's wealth is thus displayed, while the charms help to protect the baby's health. However, it is the ritual object, produced by skilled members of the society, given painstaking attention and used ceremonially, which represents the highest artistic achievement of such cultures. The spiritual leader of the group would have a cache of powerful, hand-made objects, usually woodcarvings, which only he could use to maintain or restore the health of the group and its members. Men who distinguished themselves in battle or the hunt were eligible to wear costumes and masks for ceremonial dances (Sellato, 1989). The textiles of the Indonesian islands have a historic, almost mystical link to birth, marriage and health (Gittinger, 1979). As contact with the outside world increases, these traditional cultures inevitably change. The introduction of new ideas and belief systems; changing access to natural resources; the availability of new trade goods and the disappearance of old; new authority figures - supplanting traditional local leaders; new employment and education opportunities - all contribute to this change. If, however, alternative motives for handicraft production either evolve or are introduced, the cultural heritage of rural societies may be maintained and preserved, not in the glass case of a museum collection, but actively fostered - a vital, socially and economically dynamic phenomenon. Until recently, most efforts aimed at development of artisanal crafts production were based on the establishment of urban-based small-scale industrial enterprises, with mixed results. A case in point is a programme in Central Java which set up a factory to manufacture high-quality European- and English-style furniture for the export market. With excellent resources, including a sophisticated wood-drying kiln and state-of-the-art machinery, the programme employs several hundred workers, men and women. Traditional wood-carvers were recruited from the region of Jepara (historically known for its fine artisans) to make hand-carved components for the furniture. Project leaders have yet to solve the chronic problem of absenteeism. Although the carvers earn good money, they are unhappy at the job site, a significant distance from their home region; after accumulating enough earnings, they often return to their home villages (Tenbrink, 1987 - personal communication). Taking the time to nurture crafts within their natural setting would appear to have greater potential for success. A series of micro projects tailored to the specific conditions of a particular tribal group is more apt to take root and sustain itself (Kerr, 1990). For example, a modest project in the traditional pottery village of Kasongan, Central Java, undertaken by Aid to Artisans, introduced appropriate technology oil-burners and brick kilns, and trained the artisans to fire their wares at higher temperatures, thus strengthening them. With an improved product suitable for export, the artisans are now earning significantly more than before. Further, new small business ventures have sprung up, boosting the local village economy (ATA, 1990). A word of caution is merited with regard to introduction of new technology, however. What may work in an industrial setting will often suffocate home-based handicrafts -especially where women's roles are concerned. The introduction of "labour-saving" machinery can threaten the hand-made nature of the crafts; moreover, case-studies consistently show that, when "improved technology", is introduced, women are generally excluded from access to the new machinery (FAO, 1987a; Campbell, 1990). Thus, any training programme must address these issues and devise ways to meet women's special needs. Artisans working in rural areas are affected by factors not relevant to their urban counterparts. Whereas urban-based artisan industries employ significant numbers of both men and women on a full-time basis, rural-based artisans tend to work part-time in the home. This has both positive end negative potential implications. On the positive side, handicraft employment can complement agricultural labour, without necessitating migration. In Thailand, for example, where rural farmers produce the majority of wicker crafts, crafts sales represent 35 percent of total household income. As many as 75 percent of Thai weavers work seasonally as farm labourers, while 74 percent of woodcarvers work in agriculture and 66 percent of bamboo artisans farm as well (Pye, 1988). On the negative side, this creates a potential conflict of time between subsistence production and handicraft work for cash. A particularly sensitive issue relates to the access and utilization of natural resources for raw materials - who ought to be allowed access, for what purpose and to what extent. The rural setting for most handicraft production has important implications for forestry policy. The complex issues of land tenure and access to raw materials such as wood and rattan require sensitive, balanced solutions if the needs of crafts producers are to be met. The perspective of villagers accustomed to access defined by complex traditional precedents is often at odds with recent federal laws aimed at resource protection. Furthermore, some of the new laws appear to conflict with one another, further confusing the villagers (Weinstock and Sunito, 1989). Although laws exist to permit villagers to cut ironwood in Kalimantan, government policy is by and large tipped in favour of the large producers of raw materials, who are the main beneficiaries of government concessions and permits (Peluso, 1989). Recent studies on indigenous peoples and the impact of their traditional lifestyles on tropical forests appear to indicate that crafts development represents a constructive alternative to destructive land-use practices. A nonagricultural, settled life-style in which handicraft traditions are cultivated seems to hold potential for improving rural village livelihood, on a sustainable basis (Kerr, 1990). As studies continue to examine how traditional people interact with their environment - often more sensitively than was once supposed policies which attempt constructively to conserve useful traditions should emerge (Peluso, 1989). Institutional support in the procurement of raw materials can be of great use to artisans (FAO, 1987). However, a caveat is also appropriate; wherever a small supplier would suffice, it may be preferable to government intervention, owing to the tendency of bureaucratic supply agencies to turn into unfair monopolies (Pye, 1988). A sensitive approach to design is crucial balancing aspects of traditional motifs, patterns, and products with a knowledge of the marketplace. A surprisingly small percentage of crafts entrepreneurs and producers are involved in product design and development (Pye, 1988); however, some development and training programmes have incorporated a design component. For example, a joint UNDP/FAO regional workshop focusing on the design and manufacture of bamboo and rattan furniture was held in Indonesia in 1989. In addition to information on technical manufacturing processes and international marketing strategies, the workshop featured a design component led by an experienced Italian furniture designer. The proceedings of the workshop have been published and serve as a guide to investors and entrepreneurs (FAO, 1990). Although the workshop was primarily concerned with small-scale industrial production, as opposed to home-based crafts, it is encouraging that the subject of design received attention. As the export market in handicrafts represents the highest earnings potential for artisans, knowledge of the marketplace is crucial, yet the Western marketplace is alien territory to most artisans. Of critical concern is the accessibility of market opportunities and any subsidized marketing programmes. Craft cooperatives, organized as a central buying exchange where many tiny producers can combine to satisfy large orders, are often useful. For example, in Central Java, batik cooperatives were set up by the government as part of a rural development programme in the 1970s. In East Kalimantan, the remote village of Tanjung Isuy on the Mahakam River has an active crafts cooperative which serves a number of even more remote villages in the region. Once a group of artisans successfully penetrates the export market, the tale is not over. Market success can mean the development of an important activity, with hundreds of people dependent on the sale of the handicrafts. The international market can be heartlessly fickle; demand for a product can disappear rapidly. Therefore, new applications, adaptations, approaches and markets must be continually sought. Aid to Artisans (ATA) is a non-profit organization based in Farmington, Connecticut, United States, offering pragmatic assistance to artisans in developing countries and economically depressed areas of the United States. Since its formation in 1976, ATA has been active in 30 countries in Asia, Africa and Latin America. ATA paces particular emphasis on marketing, helping Third World artisans to reach developed country markets, particularly the United States. "We provide whatever may be necessary - raw materials, technical assistance, design consultation, business management advice - to bring the crafts of the Third World artisans into the marketplace," explains Clare Smith, President and Chief Executive Officer of Aid to Artisans. 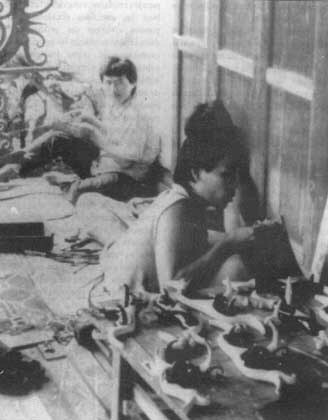 One example of ATA assistance in crafts development is a project in Honduras. Over a five-year period (1985-1990) ATA trained more than 500 rural artisans, most of them women, to produce crafts designed from readily available natural resources including dried flowers, cornhusks and terracotta clay. Initially, ATA provided design, training, business management and marketing resources. The project aimed to create opportunities for artisans, and a self-sustaining crafts production business. Called Amano, this unique organization has handmade its own success. In 1987, orders for Amano products at the New York International Gift Show in August amounted to US$ 40000; in the January 1988 gift show, they increased to over $54000. As of the writing of this article, the Honduran entrepreneurs are managing a successful enterprise, completely on their own (ATA, 1987,1988,1989). In many developing countries, policy is beginning to reflect the potential positive outputs which limited, well-managed eco-tourism can bring in the context of conservation. One particularly promising source of development potential may be found in what is known as "cultural tourism" (Weir and Manan, 1989). This approach links tourist attractions to the culture of the indigenous peoples: colourful ceremonial celebrations; exotic dances and music; and intriguing ethnic arts and crafts. Indonesia's special mix of diverse ethnic cultures makes it a prime candidate for cultural tourism development. In fact, 1990/91 has been designated the Year of Visiting Indonesia. Visitors to the Toraja highlands of Sulawesi can visit genuine Toraja villages and be exposed to the extraordinary architecture of the region. They can also buy handicrafts made by practicing artisans who may live and work in the village. This escalating commitment to tourism will also have major implications for handicrafts development. Although the volume of handicraft sales to tourists cannot compare to the export market (Pye, 1988), the handicrafts play an integral role in support of the performance arts which are of primary importance to tourism. Working together, the crafts become important catalysts in building ethnic pride and maintaining or reviving cultural practices which otherwise might become extinct. In the summer of 1990, the Forestry Department of FAO and the Unesco International Fund for the Promotion of Culture (IFPC) jointly undertook a feasibility study on the potential for handicrafts development in the forestry regions of the outer islands of Indonesia. Working with Aid to Artisans, FAO and the IFPC sent a team of three crafts specialists, the author of this article, P. Gearheart and Z. Siregar, to interface with the FAO-Government of Indonesia Forestry Studies Project. The study was the first time that forestry experts, ecologists and sociologists had worked with professionals from the crafts development field. It was an excellent experience for all involved: the team got a crash course in forestry issues; and the forestry experts gained some insights into the complexities of handicrafts development. In terms of practical output, the team developed a three-tier, flexible model for crafts development in the Indonesian setting, and a series of project proposals. At level one, implementation is designed to relate primarily to rural people with an established crafts tradition. Project profiles have been prepared for the Dayak of East Kalimantan and the artisans of Tanah Toraja. Level two is aimed at areas where crafts development is considered a desirable component of integrated development but where the local people often shifting cultivators or resettled communities - do not have a readily-perceived crafts background. A project profile has been prepared as an element for insertion into a larger watershed management effort. At level three, implementation is designed to meet the needs of industrial production of handicrafts. A project profile has been prepared aimed at further development of the wood and rattan artisanal industries of East Kalimantan. Crafts development activities should be considered as part of overall development efforts for a given region, rather than an economic panacea that will provide "instant" alternative employment and income opportunities. However, if treated as one element in the development of a comprehensive forestry development programme, handicrafts can make an important contribution to the development of a local economy based on environmentally and socially sound principles. Expectations from efforts aimed at handicrafts development should not be exaggerated. Economic development handicrafts production, alone, cannot be expected to result in maintenance of cultural traditions. In fact, as has I noted above, keeping pace with the demands of the international marketplace may often require modification of traditional designs. However, the improvement of employment and income-generating opportunities based on crafts skills - wood-carving, weaving, pottery, etc. - cannot but help to foster the maintenance of traditional knowledge held by the craftspeople themselves. ATA (Aid to Artisans). 1987. The New York market link. ATA News, fall issue. ATA 1988. Notes: New York gift fair. ATA News, spring issue. ATA 1989. New York gift show 1989. ATA News, spring issue. ATA 1990. New York gift show 1990. ATA News, spring issue. FAO. 1987a. Small-scale forest-based processing enterprises. Forestry Paper No. 79. Rome. FAO. 1987b. Restoring the balance: women and forest resources. Rome. FAO. 1990. A workshop on design and manufacture of bamboo and rattan furniture. Field Document No. 17 (PAS/86/048). Kuala Lumpur, FAO. Gittinger, M. 1979. Splendid symbols: textiles and tradition in Indonesia. Washington, D.C., The Textile Museum. Peluso, N.L. 1989. The role of non-timber forest products in shifting cultivation communities and households: current knowledge and prospects for development. Forestry Studies Field Document No. II-2 (UTF/INS/065/INS). Jakarta, FAO. Pye, E.A. (ed.). 1988. Artisans in economic development. Ottawa, International Development Research Centre. Sellato, B. 1989. Hornbill and dragon. Jakarta, Elf Aquitaine Indonésie. Weinstock, J. & Sunito, S. 1989. Review of shifting cultivation in Indonesia. Forestry Studies Field Document No. VIII-1 (UTF/INS/065/INS). Jakarta, FAO. Weir, J.S. & Manan S. 1989. Environment and conservation aspects of forestry in Indonesia. Forestry Studies Document No. VIII-1 (UTF/INS/065/INS), Jakarta, FAO.